Looking for maximum protection for your documents? 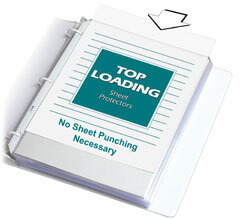 Heavyweight sheet protectors have built-in antimicrobial protection. Antimicrobial protection helps prevent the growth of stain causing bacteria, yeasts, molds, and fungi for the life of the sheet protector. No sheet punching is necessary. Acid-free protection means no photocopy transfer. Top Load, Clear. Triclosan-free. 100/BX. Antimicrobial Protected Sheet Protectors --- Antimicrobial technology helps prevent the growth of stain causing bacteria, yeasts, molds and fungi on the sheet protector surface. Triclosan-free. Sheet Protector Special Features: Polypropylene, top-loading antimicrobial protected sheet protectors preserve and protect high-use presentation materials, letters and reports. Hi, I'm John at C-Line and today we're going to talk about our Antimicrobial Protected Sheet Protectors. These heavyweight sheet protectors provide durable storage for all your documents and reference materials and are made from clear, acid-free polypropylene. A special additive is added to the resin at the time of manufacture to provide the antimicrobial protection. This additive helps prevent the growth of stain causing bacteria, yeast, molds and fungi on the surface of the sheet protector. The top loading design eliminates the need for hole punching and allows you to easily add or remove pages without taking the sheet protector out of the binder. Plus, they have a strong three-hole punched reinforced binding edge that helps prevent tearing, even with heavy use. The clear finish on these sheet protectors offers a sharp, transparent view of the contents and makes them ideal for showcasing presentations and documents. They are packaged in an easy open reclosable box which is handy for storage and keeps them clean and protected. C-Line's Antimicrobial Protected Sheet Protectors store and preserve documents in their original condition. They are great for organizing your home, school and business. Order yours now! That's all we have for today. I'm John with C-Line. Thanks for watching.